In 1912, the day after hitting an iceberg in the Atlantic Oceon, the steamship Titanic sinks. Hence, it is Titanic Remembrance Day. Read Tonight on the Titanic by Mary Pope Osborne, illustrated by Sal Murdocca. April 15 is, of course, tax day—but I have never found a suitable book on the subject for the Almanac. Some concerns really are not appropriate for children. Instead I will focus on a perfect title for Poetry Month, J. Patrick Lewis’s Book of Animal Poetry. In March at the Charlotte Huck Festival in Redlands, California, the fabulous Marilyn Singer and Kristine O’Connell George led the participants in a Poetry Blast. In this spirited and animated session, one person after another came forward to share their favorite gems—from Judith Viorst to Dr. Seuss, poets both serious and goofy got their due. As people were preparing, I heard several say exactly what I was thinking. 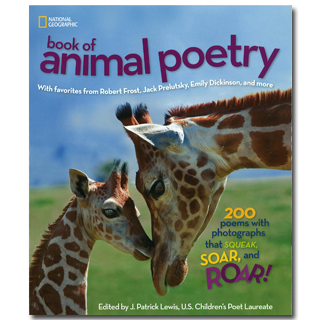 “I wish I could find a copy of Book of Animal Poetry by J. Patrick Lewis.” Published in 2012 and edited by the U.S. Children’s Poet Laureate, The Book of Animal Poetry has already become a go-to book for teachers, parents, booksellers, and those hunting for a good poem. As J. Patrick Lewis says in the introduction, “Poets often try to imagine the secret life of animals.” In one volume he then brings together poets as divergent as D. H. Lawrence on tiny fish, Benjamin Franklin (What is a butterfly?/At best/ He’s but a caterpillar/Dressed”), Ogden Nash, and Myra Cohn Livingston. Divided into sections featuring based on traits—big, little, winged, strange, noisy—the two-hundred-poem collection engages and delights readers with its insight and humor. In fact, if the book were merely a collection of these poems, curated by J. Patrick Lewis, it would be worth buying immediately. But since this collection was published by National Geographic and tapped into their great photography archive, the book has been illustrated with spectacular photographs of the creatures being presented. Giraffes, zebras, bats, elephants, and a host of others appear in their most photogenic forms. The pictures alone will make any animal lover happy for hours. Book of Animal Poetry is the kind of omnibus poetry book that—because of the cost of poetry permissions—we haven’t seen in the children’s book field for a long time. Indexes featuring poets, subjects, titles, and first lines make the book even more valuable. Classes can hold their own Poetry Blast from this single volume. For those suffering from Common Core headaches, the book can be used a cool tonic. You can incorporate CC Standards without thinking about them—for the book contains so many of the areas to be discussed. I just want to thank J. Patrick Lewis and the fine team at National Geographic for giving us this singular book. It demonstrates just how creative an anthology can be. Originally posted April 15, 2013. Updated for . Kids will surely love reading this book. 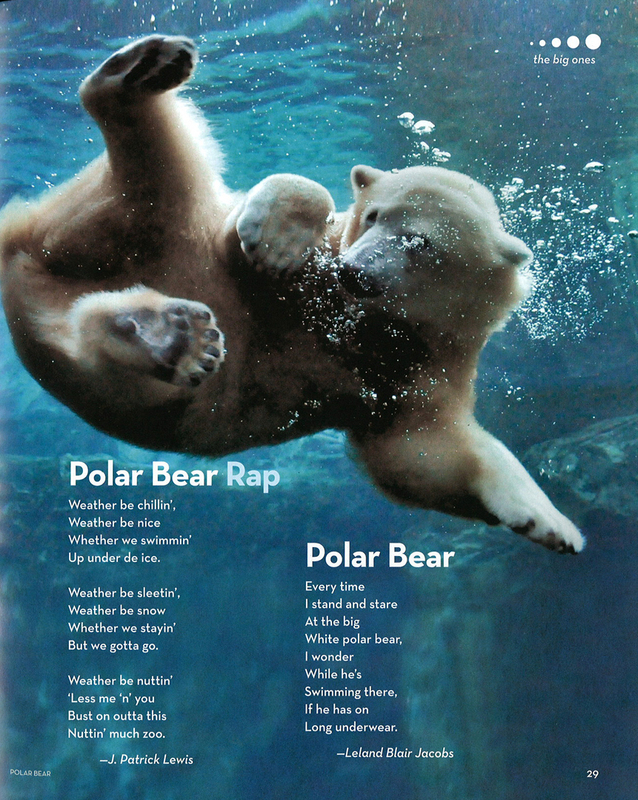 Animal books are educational and kids will love colorful pictures like this one you have there. I have been using this book at my school this week and the students have been amazed at the photos and poems. So happy to see this book here! Makes a great gift, especially with “fancy” sticky notes to mark favorite pages–one set of sticky notes for favorite photos and another set for favorite poems. The instant reaction is to ooh-and-aah over the photos (completely understandable) but the poems will bring kids (and whole families) back to the book over and again.